I’ve made lots of vegetable soups but never “soupe au pistou”. After looking over half a dozen recipes, I made my version for supper tonight. I made stock from Jennifer Perillo’s “60-minute chicken stock” (Food52). The fresh herbs came from my garden, including the basil for my pesto, and I used organic produce. Not a big fan of licorice-tasting food or booze, I was pleasantly surprised by the flavor from the fennel in my soup base. 1. Tie and thyme and parsley into a bouquet garni and set aside. 2. Heat the oil in a large, heavy-bottomed pot. Add the onion, celery, fennel, carrot, tomato and garlic. Cover and cook over medium heat for 15 minutes, stirring a few times. 3. Add the bouquet garni and the stock. Bring to a boil, then lower heat and cook for 15 minutes. Remove bouquet garni and strain stock, reserving broth and the vegetables. 4. Puree reserved vegetables in processor. Stir into broth to finish the soup base. Correct seasoning. 1. Using the same large pot, heat the oil and saute the onion, garlic, carrot celery and thyme for 5 minutes. Correct seasoning. Add the soup base, tomatoes, beans, saffron and pasta. 2. Lower heat and cook for 15 minutes. Turn off the heat, add the green beans and allow them to “cook” for 5 minutes before serving. 3. 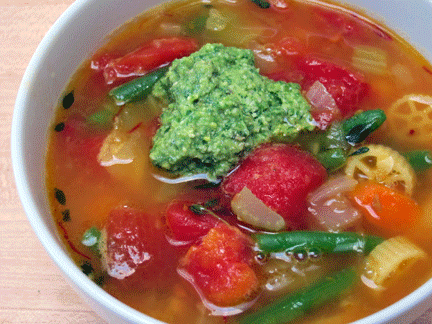 Top each serving of “soupe” with a generous spoonful of pesto. Likewise, it is warm and humid in San Diego, but fall recipes are on my mind! This sounds like a lovely soup for a fall day. I love fennel, and enjoy how its anise flavor mellows when cooked. I was slow to appreciate fennel and am still struggling with raw fennel – works well in this recipe, I think. Thanks for visiting!